Now featuring MICROBAN Antimicrobial Product Protection. Microban antimicrobial technology, built into the removable polymer mats, inhibits the growth of bacteria, molds, mildew, and fungi that cause odors, stains, and product degradation. Your shelving will be cleaner between cleanings! Click here for more information on Microban. Quick to assemble, adjust, and clean. MetroMax Q’s unique Corner Lock Release allows you to unlock shelves without the need for tools and reposition the shelf in seconds. Slide the shelf above the wedge lock connectors at the desired position on the post. Lower the shelf into position and instantly gain the space you need. Polymer shelf mats lift off the shelf for easy cleaning, and have a lifetime warranty against rust and corrosion. Available without casters. “Basic storage and transport for basic needs” PolyErecta’s advanced polymer shelf construction is guaranteed not to rust, chip, dent, or peel. Epoxy-coated aluminum posts add long-term durability. PolyErecta carts mean smooth transport of sensitive materials and apparatus. 22″ (550mm) wide stem caster carts are perfectly sized for most standard tote boxes. Shelves hold up to 375 lbs. each. Carts assemble in minutes, and tote boxes, dividers and sliding drawers can be adjusted effortlessly in seconds. Available in Desert Tan and Slate Blue, PolyErecta carts feature sizes and accessories to fit your special requirements. Available without casters. Now featuring MICROBAN Antimicrobial Product Protection! Microban Antimicrobial technology, built into the removable polymer mats, inhibits the growth of bacteria, molds, mildew, and fungi that cause odors, stains, and product degradation. Your shelving will be cleaner between cleanings! Click here for more information on Microban. The most versatile storage system on the market, MetroMax’s lightweight, open architecture advanced polymer and stainless steel framework allows easy access. Storage levels adjust at 1/2″ (12.7mm) increments, and can be added or removed as required. Shelves hold up to 800 pounds (360kg) each. In labs, MetroMax provides solutions to complex handling problems. Bottles, test tubes, and other supplies are always at your fingertips. Tote bins and sliding drawers with dividers organize even the smallest implements. Open grid shelves maximize air flow and light penetration yet remain easy to clean. Guaranteed against corrosion for a lifetime, MetroMax can be made completely mobile with the addition of casters. Wire security units provide lockable, enclosed storage with visual access to shelf contents. Options exist for Super Erecta/Super Adjustable, qwikSLOT, and MetroMax Q shelving systems. 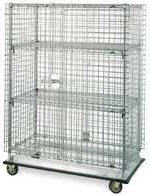 Security Modules can be installed on existing Super Erecta shelving units to enclose a section of the unit. Don't see what you're looking for ? ?